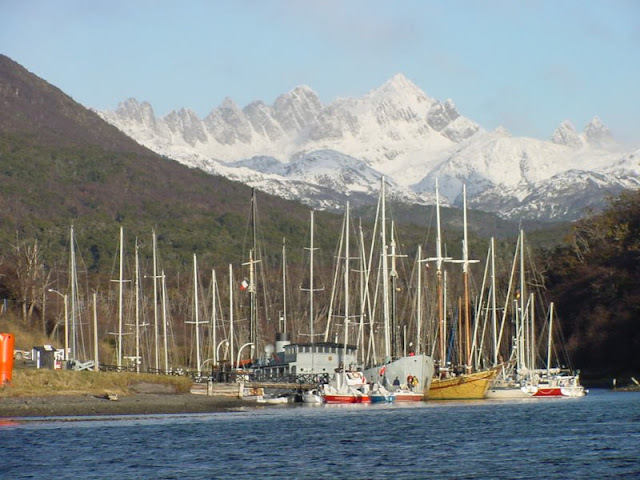 Puerto Williams, is a small port and Naval Base founded in 1953, capital of the Chilean Antarctic Province, located on the north shore of Navarino Island, southern end of the South American Continent. 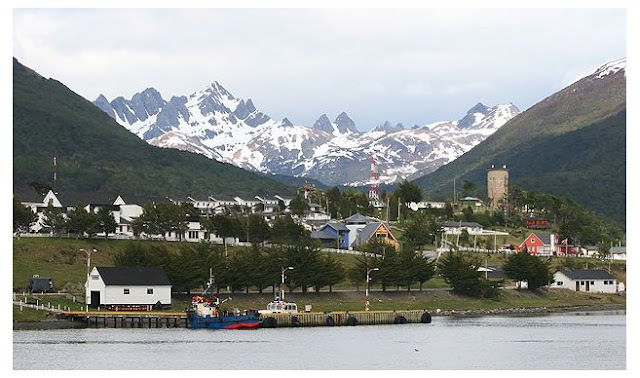 Independent of the fact that its population is very small, only 2,500 people, Puerto Williams is considered the most southerly town in the world, as its latitude is 54° 56' 00" S, south of the nearby Argentine tourist city of Ushuaia. Unlike the rest of the country, this part of Chile is the only one that borders Argentina on the North and given it is also a Naval Base, there is a significant presence of uniformed personnel. Apart from its singular location in the Globe, other attractions of Puerto Williams lie in its spectacular nature, made up of forests and a mountain range crossed by paths of great beauty, through which we can discover the animal and plant diversity while enjoying the richness of its landscape, dominated by the Beagle Channel, so called in commemoration of the brig that brought the naturalist Charles Darwin in the early nineteenth century. Another emblematic, world- renowned place within the commune is the legendary Cape Horn, one of the great icons of navigation which marks the end of the American continent. Puerto Williams is located in such a remote area of the World (more than 3500 km. South of Santiago, the Chilean capital) that according to a recent comparative study, its waters are the cleanest on the planet according to what was said by the US scientist Guido Verbeck, of the University of North Texas. Named in memory of the Austrian priest and scientist who lived among the Selknam and Yaganes natives, developing one of the most comprehensive ethnographic researches on the ancient peoples who inhabited Tierra del Fuego and adjacent islands between 1918 and 1924. Created in 1974, remodeled in 2007 and reopened in 2008. The world's southernmost museum also details the wildlife and natural resources of the region. In the grounds of the museum is also the "Casa Stirling" ("Stirling House") considered the oldest building of Tierra del Fuego Island, built in England between 1869 and 1871, declared National Historic Monument in 2003. Local Catholic temple, dedicated to the Patron Saint of Chile, very typical building of Puerto Williams. Inside is also the "Virgen de los Loberos" (Patron Saint of Sea Lion hunters), that in ancient times ventured into the sea with their fragile boats. Prow of the Cutter Boat "Yelcho"
In Puerto Williams downtown, at a side of the Liceo (High School), you can see the prow of the "Escampavía Yelcho" (Cutter boat "Yelcho"), a ship belonging to the Chilean Navy that in 1916 carried out the heroic rescue of the Imperial Trans- Antarctic Expedition of Ernest Shackleton at Elephant Island, Chilean Antarctic Territory. Tour of about 5 days. This circuit passes through places of great natural beauty and absolute tranquility, lakes and forests, different from what happens in other tours where the paths are traversed by countless people daily. It's not for nothing that this is called the southernmost trekking circuit in the World. Although not extremely difficult, the tour is recommended for people with good physical condition. The departure is from Puerto Williams bound for Cerro La Bandera to continue a journey through peaks over 1,100 meters high, amid a landscape dominated by frozen lakes, thick forests, bogs and snowy peaks, looking to the North you get impressive views of the Beagle Channel and southwards of Navarino Island up to Cape Horn. The Micalvi was a vessel built in Europe in 1925, bought and used as a cargo ship by the Chilean Navy since 1928. After a hectic life, the ship was stranded in 1961 and used as a mooring point of what is today the Micalvi Yacht Club. Small ships, from all over the World dock here before starting their challenge around Cape Horn and/or the Antarctic Continent, using the natural terrace overlooking the Beagle Channel and the mountainous surroundings of Navarino Island. "Club de Yates Micalvi" is a unique and welcoming place, with an authentic marine atmosphere left by the hundreds of sailors who have been there, leaving their memories and experiences hanging on the walls either as flags, photos, posters and gifts, all full of dates, dedications and signatures. Currently, many marine services are offered such as to provide of water and electricity, showers, Wifi, diesel fuel, a permanent boatswain at the club, garbage collection apart from other land-based activities including hiking and horseback riding. Located 5 km. of Puerto Williams. In this green area, whose name means "Hummingbird", you can observe the botanical richness of this part of the World, fused with the ancestral Yagan culture, what makes this park a real outdoor classroom, besides being a perfect place for scientific tourism. "Parque Etnobotanico Omora" encourages responsible tourism practices with an improved infrastructure and through 3 circuits of about two hours each. The tour is performed with a specialized scientific guide. But "Omora" is not an ordinary park. Here, since the year 2000 with the collaboration of the New York Botanical Garden, scientists work to understand and preserve the exuberant diversity of mosses, lichens and liverworts (a type of bryophytes) present in the area. Cape Horn and surroundings represent 0.01% of the planet's surface, but are home to 7% of the diversity of all bryophytes, which are small green plants, ancient organisms of great scientific importance. In Navarino Island there are several lakes and rivers suitable for fishing, all these places have the plus of being located in one of the most remote and pristine regions of the planet, there are tours available either by land or helicopter. The main destinations are Lago Navarino and Lago Windhond. The fishing season runs from October to April.